Three years ago, Sacred Heart Academy in Grand Rapids, Michigan was a failing school. It was down to 69 students in the entire K-12 program, employed only six teachers, and was a financial “drain on the parish,” according to the school’s provost, Zach Good. This fall, however, the school—which is 100 years old and was formerly known as Sacred Heart of Jesus School—will be approaching an enrollment of 300 students (with new families continuing to inquire about enrollment), and the financial situation has greatly improved, as have the school’s intellectual and spiritual cultures, said Good. What changed in just three years? The administration, with the approval and ongoing support of the pastor and bishop, switched to a classical Catholic liberal arts curriculum. In fact, the administration has changed 90 percent of the school’s curriculum. “Every year we freely embody our vision, it gets easier,” said Good. “There’s not much room for regret.” The vision to restore the school to the classical Catholic liberal arts tradition has become a reality thanks to a positive working relationship with the local homeschooling community, refusal of government funding and traditional teacher training, and the guidance of the Institute for Catholic Liberal Education, an organization dedicated to the renewal of Catholic education. Sacred Heart Academy offers two programs to students. The first consists of a fulltime program through 10th grade, including a Montessori Pre-K program for three-to-six-year-olds. As part of this, the school offered their first full-time 9th grade year last year, and this fall, will offer it for 10th grade. The other program is a classical enrichment program for homeschoolers offered to part-time 2nd through 12th-grade students. In the classical enrichment program, students meet two times a week on campus, and complete the rest of their course work at home. Good said by the time the students in the classical enrichment program get to high school, the course work they are doing looks a lot like a college curriculum. Students in both programs take Latin, classical literature, mathematics, and sacred music, among other offerings. According to Good, the school is committed to both programs for the long haul. One selling point of the curriculum Sacred Heart offers is that students are being more fully formed, said Good. Although he and the rest of the administration are skeptical of standardized test scores, he said state standardized test scores in reading, writing, and math have improved significantly at most grade levels. Two students earned perfect scores on the National Latin Exam, and other students have done well on Advanced Placement (AP) exams. “The students are better writers, more articulate speakers, deeper readers. Parents have remarked that dinner table conversations have improved,” Good said. Many of the enrichment program’s graduates are discerning vocations to the religious life, and eighth grade students have scored as proficient or above average on the Assessment of Children/Youth Religious Education (ACRE), which measures students’ knowledge of the Catholic faith. Mark Salisbury, superintendent of schools for the Diocese of Marquette in Michigan, began implementing a classical curriculum for all nine diocesan schools in March of 2014, with approval from his bishop. Salisbury’s rural diocese has only implemented new language arts and religion curricula thus far, with plans in the works to offer Latin at all schools, which go to 8th grade, next year. Although he admits the rollout has not been as consistent as he would like, due to the fact that the schools have different personalities and, as a result, some have taken smaller steps than others, he is already seeing positive results. This year, in their annual survey of parents, the number of parents who said they were “highly satisfied” went up 7 percent, according to Salisbury, and he said he expects that percentage to go up next year. What is the classical Catholic liberal tradition? Why is it important? In the classical Catholic liberal tradition, Catholic education has Christ at the center, with an emphasis on seeing education through the lens of “the good, the true, and the beautiful, as a means to encounter God,” Salisbury said. He added that the goal of Common Core is to make you college and career-ready. “There is nothing wrong with that, but it isn’t going to form you into being a saint,” said Salisbury. The Institute for Catholic Liberal Education is not only educating Catholic school administrators and educators about the lasting beauty and depth of classical Catholic education, but also helps educators like Good and Salisbury “renew their schools through conferences, teacher development programs, in-service workshops, and consultations,” according to the website. Meanwhile, vocationalism dominates the entire K-12 mindset. “Students are in schools in order to get good grades, to get in good colleges, to get good jobs. The whole system is ordered to passing tests,” he said. “With classical education, we are forming students so they can be excellent at whatever they do,” Seeley said. The subjects studied during the course of the school day, including Latin, mathematics, sacred music, and classic literature, are chosen because of their universality, and the fact they point every human being toward knowing God and his Creation, according to Good. Pressure from the sciences to form students so that they would take on jobs in a technocratic society, along with a need for standardization, led public school to lose its classical focus, which in turn, led the Catholic schools that were actually offering classical curricula to do so as well, Seeley said. What societal disorders have we seen as a result of that? “One name is Trump, and the other is Clinton,” Seeley said. Another problem is our excessive reliance upon established procedures, he said. We become dependent on whatever government or corporate office is setting the standards. As a result, “we’ve lost our social initiative,” he said. No one in the schools is taught to question anything, and there is no common view or common ground to discuss the important issues our culture faces. “You can never suggest that that one thing is better than another,” Seeley said. In the case of Good’s school, new pastoral leadership saw the school was not sustainable as it was. “The financial situation was a mess,” he said. As a result, they received permission from the bishop to close. But the pastor held a town hall meeting, and said if they were willing to make a radical change, and make it a classical school, they could keep it operational, according to Good. The school then went from being Sacred Heart of Jesus School to Sacred Heart Academy. According to Good, as soon as the decision was made to re-found as a classical school, the administration ceased receiving any state and federal funding. The free lunch program was eliminated, as well as money for teacher professional development. The lunch program was “not only not making money, but led to an enormous amount of paperwork,” Good said. “In the last five years, things like this have become more burdensome.” He said one school he knows of eliminated the school lunch program, and orders in every day, yet it is still cheaper than the government program. Not receiving government money for teacher professional development appeared to pose the bigger problem for the school, especially since there was a need for significant investment in teacher training. As they began making changes, however, various people came out of the woodwork who wanted to provide professional development, often for free, he said. Teacher certification and an education degree are not nearly as important as having knowledge in a particular field, Good said. “I can take a history major who has never had an education course, and over the summer give him a crash course in classroom management. I can’t take someone with a certification and teach him history. As we were hiring, we have at times needed to hire teachers without teaching certificates, in order to make the best decision,” Good said. “This is something we had to work out with the diocese. The bishop and superintendent have championed what we did. We did have to make the case why we had to make the change,” Good added. A significant investment in curricula needed to happen as well, but fortunately increased student enrollment made up for much of it. “The easiest and least expensive transition to make is to get good literature—get a classroom set of The Lion, the Witch, and the Wardrobe, Little House on the Prairie, Wind in the Willows,” Good said, adding that Latin is also a very affordable curriculum option for a school to incorporate. Good and Salisbury have both had their teachers take advantage of professional development programs offered by the Institute of Catholic Liberal Education, which includes the Catholic classical schools conference, in-service workshops, webinar series, and a week at Aquinas College in Nashville, among other programs. As a result, he said some independent Catholic schools receive accreditation through the National Association of Private Catholic and Independent Schools (NAPCIS). NAPCIS was started to “preserve and promote Catholic education founded in obedience to the Pope and Magisterium,” according to the organization’s website. Does classical education have a place in the modern world? He went on to say they have to prepare students for a two-fold vocation: a vocation to work in the world, as well as significant participation in the story of salvation history. According to Good, there are now more homeschooling students in the US than there are Catholic school students nationwide. 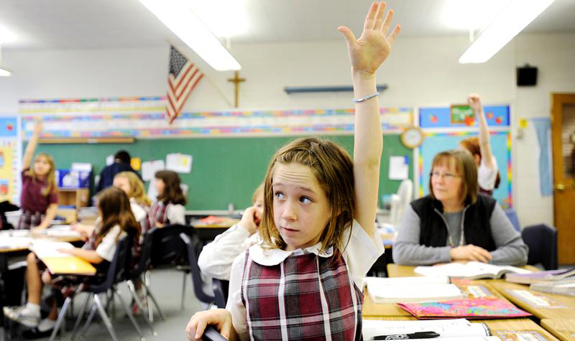 “In 2012, the number of Catholic school students nationally had decreased 4 percent. Meanwhile, the number of homeschooling students had increased 8 percent. That trajectory is just increasing,” Good said. Catholic educators across the country are expressing interest in changing over to a classical curriculum, according to Seeley, who said he has more requests for services than he has staff to fulfill the need.